Why Is Jose Reyes Still Playing For The Mets? When you’re still a Met. It still doesn’t quite scan, given that Jose Reyes is one of the best players ever to play for the New York Mets, but it’s true. Purely from a baseball standpoint—surely the most charitable standpoint from which to view someone who was suspended for 51 games by Major League Baseball for an incident of domestic violence and subsequently released by a lousy team, and who returned to the Mets on waivers back in 2016—there simply isn’t any argument for keeping the current version of Jose Reyes on the Mets. Keeping him around is not, it appears, a baseball decision. “Pro scouting advised his removal from the roster a long time ago,” a source familiar with the department’s thinking said. The numbers support that negativity. Reyes enters Wednesday with a season slash line of .187/.257/.281, good for an OPS+ of 52. He’s at 183 plate appearances, and in the history of the Mets, among those who played at least that much, it would be the 21st worst offensive campaign ever. 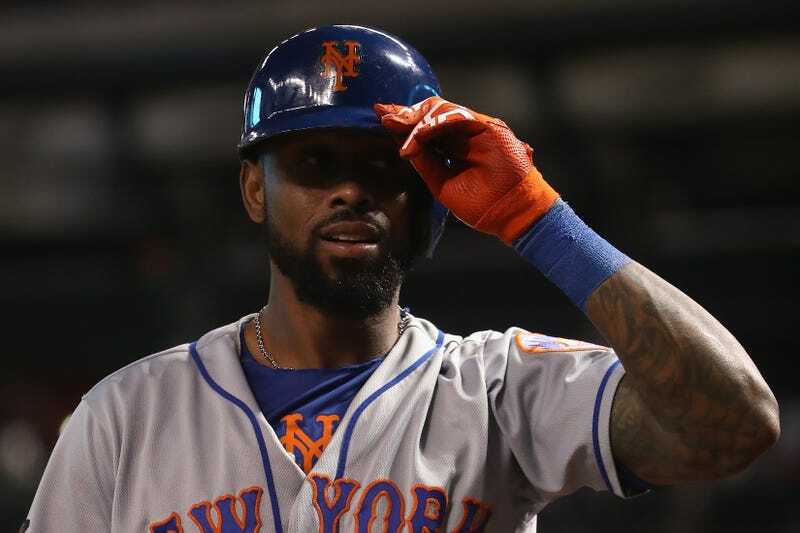 Jose Reyes’s continued and otherwise inexplicable presence on the Mets roster offers a window onto the question of how this team wound up here, again. And while many others on that list of Worst Hitting Mets Ever reached the field due to their defensive prowess—Mets fans of a certain age will wax poetic about Doug Flynn’s defense at second base, and Charlie O’Brien threw out runners from the catcher position at an elite level—Reyes has not provided anything like that kind of defense at any of the three positions he’s played this season. He has been well below average, per Fangraphs, at both third and short, and while he has played too few innings at second to measure, he has three errors there in just eight games. So if this is the baseball argument—and even Sandy Alderson, at an event at Citi Field this past weekend, told Kate Feldman of Baseball Prospectus that the team was ready to release Reyes at one point, but ultimately decided that, with the team on the West Coast, refrained because “he deserved more than that”—then what exactly is it that is keeping Jose Reyes on the Mets? The team is no longer on the West Coast, and lost to the Reds by the score of 6-1 on Tuesday. In the context of another lost season, Reyes occupying a roster spot does not look like a terribly meaningful thing. But the fact that he is still there—in defiance of all evidence, and apparently also a contingent of the team’s staff—is meaningful for what it suggests about the way the team operates, the broader handicaps it faces, and how all that is likely to impact the forthcoming effort to rebuild. The Mets are on pace for their second straight season with more than 90 losses, and have arrived there with a roster that’s not notably changed from last year’s model. None of this works, but Reyes’s continued and otherwise inexplicable presence on the roster offers a window onto the question of how this team wound up here, again. Reyes was a Met from the start of his career, an international signing out of the Dominican Republic who debuted with the 2003 Mets just shy of his 20th birthday. He was arguably the team’s most beloved player during one of the better periods in Mets history, as odd as that is to declare about a three-season stretch in which the team lost a deciding game for the NL Pennant on its home field in 2006 and then suffered a pair of painful September collapses. Those outcomes weren’t great and the process that produced them, such as it was, wasn’t sustainable. But Reyes undeniably became the sort of dynamic star that the Mets had never developed—a stolen base dynamo who led the league three times, with a season-high of 78, and who added four different seasons atop the leaderboard in triples. He had power and charisma and range and a rifle sidearm throw that caught many a runner just ahead of what they surely believed would be an infield hit. Even as the Mets sank into their post-Madoff financial morass, Reyes continued producing, hitting .337 to win a batting title in what was otherwise a bleak 2011 season. But Reyes hit free agency at an inopportune time. The Marlins came calling—the team was undertaking one of the Potemkin commitments that defined the Jeffrey Loria administration—but his hometown team never even made him an offer. Reyes remembered that he was personally aggrieved that he did not even hear from Fred or Jeff Wilpon. What followed was a peripatetic series of sideways or downward moves—his failure to get a no-trade clause from the Marlins led to an unexpected trade to the Blue Jays, then being dumped to Colorado in the trade that brought Troy Tulowitzki to Toronto. His game suffered even in the Denver air that could have delivered 30 triples a season to Reyes in his prime. Things were trending down. And then the moment that delivered Reyes back to the Mets arrived. In Hawaii with his wife, Reyes grabbed his wife, Katherine Ramirez, by the throat and threw her into a glass door at the Four Seasons Wailea in Hawaii. Ramirez did not cooperate with law enforcement and criminal charges were dropped, but Reyes was suspended the first two months of the season by Major League Baseball. Once the Mets had the chance to sign him for a prorated league minimum—the Rockies preferred to take on the rest of his salary simply to let him go—Reyes apologized in a press conference, but did not deny the substance of what was reported. And for the remainder of 2016 and all of 2017, with the Mets paying him the league minimum while another team paid out the the end of that big contract that the Marlins gave him, the status quo held. A number of Mets fans welcomed Reyes back. Anyone with a history of domestic violence, and many others, shuddered every time Reyes stepped to the plate and received cheers. And for Reyes, getting the approbation he sought from Fred and Jeff Wilpon years earlier had finally happened, at a moment in his life when he needed it the most. When there are more happy people. There is a lot to leave aside, here, but from a strictly baseball perspective, it was hard to argue that any of that was a bad deal for the Mets. Reyes, on a roster with a distinct lack of viable alternatives on the left side of the infield, posted an OPS+ of 98 in 2016 and 2017. Their choice was different than some other teams that acquired domestic abusers, but only by a question of degree. Instead of a shutdown closer like Aroldis Chapman or Roberto Osuna and therefore ceding the moral high ground and antagonizing anyone who experienced domestic violence to sit through a baseball game without a consistent reminder of their most traumatic event in exchange for a chance to win a World Series, the Mets brought back Reyes so that they didn’t have to employ, say, Alexi Amarista. But this past winter, in a move opposed by many in the baseball ops department, the Mets re-signed Reyes with their own money, on a one-year, $2 million contract. The Mets could—and did—pretend that they had a chance at contending this year; the Reyes signing was justified, in that context, as an attempt to shore up the team’s bench. The idea of the Mets as contenders was always unconvincing, but they weren’t that far removed from success—they made the World Series in 2015 and eked into the playoffs in 2016 despite a spate of injuries. The team seized on the argument that a simple return to health by the team’s starting pitching would render 2017 a brief detour in an era that would improve notably on the most successful period of Reyes’s previous stint with the team. That didn’t happen. An 11-1 start quickly devolved into a 10-18 May and a 5-21 June, the latter among the worst months in franchise history. Reyes, despite sporadic playing time, quickly became the target for much of the fan ire. He was hitless in his first 21 plate appearances, went 5-for-38 in May, and seemed unable to find his rhythm at the plate in his role as a part-time player. In mid-June, while hitting .149, he complained to the media about his lack of playing time. “He certainly hasn’t earned it on the field,” one observer familiar with baseball ops’ thinking said. And yet the opportunities kept coming. That combination of poor performance and public grousing is almost always followed by a DFA; Shawn Kelley, a solid reliever in a Nationals bullpen that needs them, only had to spike his glove to get cut loose. Certainly, there was no baseball argument for Reyes at that point, both because of his struggles and because the Mets have a number of infielders who are far likelier to help the team in 2019 and beyond and who are capable of playing every position Reyes could possibly man. And yet, a funny thing happened after Reyes asserted that he needed more regular time in the lineup. He’d started 13 of 65 games prior to that moment, but then started 22 of the next 43.Eyebrows went up across the scouting department that had recommended jettisoning him months earlier. “He certainly hasn’t earned it on the field,” one observer familiar with baseball ops’ thinking said. And yet the opportunities kept coming. The work continued apace Tuesday afternoon. Reyes parked himself at third base, the position where he often found himself during Todd Frazier’s absence. Reyes took grounders, making the turn to throw out an imagined runner forced at second. He wandered over to shortstop and chatted with Amed Rosario, his heir apparent. He took his turns in the cage, lefty and righty, occasionally sending balls into the gaps that would have been instant triples for the Reyes of last decade. He talked with Michael Conforto between reps until Jay Horwitz, the team’s longtime PR maven, called him over to sign some autographs, take some photos, and even pitch to a young girl with a bat and ball. In other words, to represent the Mets. And then Reyes took a seat on the bench, at least for the night. “We want to [win] within different parameters now…. Going into 2019, going into the winter, going into next week, we want to know what we have,” Mets manager Mickey Callaway said on Monday. So I asked on Tuesday whether, in light of that, Callaway expected Reyes’s role to change. Again, though: Jeff McNeil, recently called up and hitting extremely well after a late-blooming trip through the upper minors, plays second base. Amed Rosario, the team’s best infield prospect since Reyes, plays shortstop. Frazier, while no rookie, is signed for 2019 and has played third base very well as recently as last year. Even the marginal advantage for the future of playing Reyes ahead of Luis Guillorme, 23, a versatile infielder under team control for years to come, isn’t an argument anyone can really make. And so two overlapping but disparate parts of the Mets fan base—those horrified by the employment of Reyes given his domestic violence history, and those annoyed that he is blocking key prospects every time he takes the field—are now united in their rage over his presence in the lineup. Reyes is not just aware of this, but mindful of it. When I asked Reyes about how different it is for him, a once-beloved Met, to step on the field and hear boos, he was quick to take responsibility for the fan reaction. Clearly Reyes has sacrificed a ton of goodwill with the fans over that night in Hawaii. No one booed Ichiro in Seattle as his production dropped; when the team moved him from the active roster into more of an emeritus role after a feeble showing early this year, no one objected. Plenty of franchise legends skate by on past successes. The Mets, as they generally do with veteran players, have vaguely touted Reyes’s mentorship as a reason to keep him around. That doesn’t have to mean keeping him on the active roster, but that’s the route the team has chosen. But of course it’s not just about what he can do as a baseball player anymore. I asked Reyes whether he thought that what happened in Hawaii has anything to do with the level of rejection he is experiencing from the fans. When you’re remembering the good times. Feldman sees the Reyes problem in different terms. And yet none of that explains why he’s still on the team. If the fans don’t want Reyes to play, and baseball ops doesn’t want Reyes to play, and there are better players on the roster, exactly who in the entire Mets universe is making this happen? Both the team’s players and baseball ops have taken note of how often the team’s owner pops into Mickey Callaway’s office. What is said there? I couldn’t tell you that. Fred Wilpon hasn’t spoken with the media since asserting in 2013—falsely—that all of his loans were paid off. A Mets spokesperson did not respond to a request for comment on any role Fred has played in determining Reyes’s playing time, or Jeff’s role in overruling baseball ops and bringing Reyes back. And yet Callaway’s Mets have give tons of playing time to a player who has been declared finished by the team’s own pro scouting department. Whether that is because ownership is unwilling to listen to the team’s own baseball people, which has been a common-enough occurrence in years past, or whether this is a perfect storm of faulty evaluation and willful alienation of the team’s fans, that outcome pushes any kind of trust in the team’s future process beyond the point of absurdity. It’s hard to even say this has worked out for Reyes, although he repeatedly stressed how blessed he feels for the chance to keep playing—“not every guy gets the opportunity to do that.” When I asked him whether the waning years of his career were what he pictured, amid torrents of boos and hits coming infrequently, he laughed. Reyes said Callaway hadn’t spoken to him about any change in role going forward, and he sounded like someone who fully expects to finish the season and go out on his own terms. If he prefers to return in 2019, even if the team’s baseball ops department recommends against it, he just might get that chance. “You know, in this moment, it’s just trying to finish strong and see what the future holds,” Reyes said. “I will have to feel the decision first, talk to my family. My body feels good, man. I feel healthy. There’s no problem with my body. So we’ll see what happens. I don’t want to say something, and then at the end of the season, change my mind. So if I’m going to retire, I’ll say it one time, and that’s it.” He said it like someone who believed that last call would be his to make. There’s no reason to believe he’s wrong about that.